Oh boy, have I been having a ton of fun lately! I’ve spent the last two weeks playing around with different fabrics to make my new 3 Way Shoe Pattern and the results have been amazing! This 3 Way Shoe pattern for 18 inch American Girl size dolls can make a pair of shoes using vinyl, faux suede, felt, fleece, pinwale cord or any medium weight woven fabric. 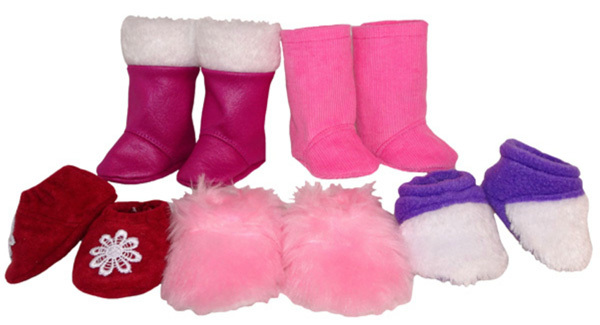 Then by switching out some, or all the top fabric pieces for faux fur, you can instantly create a pair of warm and fuzzy slippers. If that isn’t enough, the pattern pieces also allow for you to create a groovy pair of boots with or without a fur trim.….the options are endless! This pattern is super easy to make and I’m sure it won’t be long and your doll will have a shoe collection to rival the shoe department at Macy’s! As a bonus, this pattern also includes pattern pieces for shoes and boots to fit the 20 inch Australian Girl doll who has a slightly larger foot. And as with all my patterns, you get step-by-step video instructions where I show you how to make this wonderful shoes, slipper or boot. I’m so excited to see what you all create with it so please send me photos or share them on my Facebook page. Cabbage Patch size pattern is coming soon so stay tuned. Get your 3 Way Shoe pattern for 18 inch American Girl doll today.